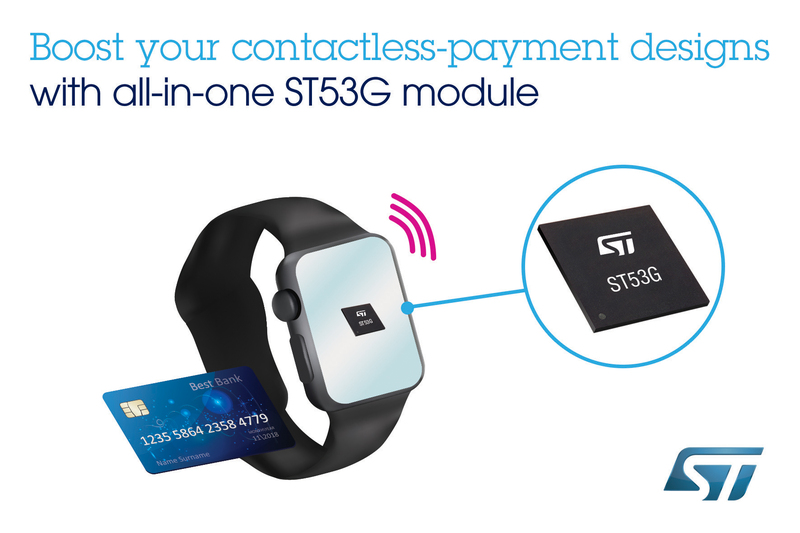 STMicroelectronics (NYSE: STM) , a global semiconductor leader serving customers across the spectrum of electronics applications, is delivering the technology for easy and secure contactless transactions using the ever more popular wristbands or fashionwear like watches or jewelry. The market-unique ST53G System-in-Package solution combines the Company’s industry-leading expertise in Near Field Communication (NFC) and secure-transaction chips. As consumers become increasingly comfortable with making secure transactions using their smart devices, traditional card manufacturers want to extend their offers into contactless wearable products for uses such as payments, ticketing, and access control. These can be difficult to implement within tight size and cost constraints, because conventional separate NFC-radio and security chips demand extra space and complicate design. In addition, wearable form factors reduce the options to small antennas that can restrict communication performance. ST’s new ST53G System-in-Package overcomes these barriers by combining a miniaturized and enhanced NFC radio with a secure banking chip in one compact 4mm x 4mm module. The Company’s industry-leading, proprietary boostedNFC™ technology allows wearables with small antennas to deliver a great user experience when interacting with card readers over typical contactless distances. The simplicity of this all-in-one module helps card manufacturers to quickly introduce functional and attractive wearables that can range from fashion items to one-time devices like event wristbands. ST offers an extensive development ecosystem, including radio-tuning tools and pre-defined antenna configurations. The ST53G meets all relevant card-industry standards, including EMVCo™ compliance, ISO/IEC-14443 NFC card emulation, and MIFARE® ticketing specifications. The ST53G completes ST’s range of System-on-Chip products, and can host ready-to-use STPay smartcard operating systems and optional VISA/Mastercard/JCB-certified banking applications pre-loaded on the secure microcontroller. Engineering samples of the ST53G System-in-Package in the 4mm × 4mm WFBGA64 package are available now. Full production is scheduled to start in Q1 2018. Please contact your local ST office for further information and pricing options. The secure banking chip contained in the ST53G System-in-Package leverages ST’s proven ST31G480 secure microcontroller for high-performance smartcard applications, which is based on the Arm® SC000 SecurCore® processor. It features a secure architecture with a NESCRYPT coprocessor for public-key cryptography and hardware accelerators for algorithms like AES and triple-DES. Extensive anti-tamper protection including an active shield, environmental monitoring, a unique serial number for each die, and protection against numerous other attacks is also built-in. These features complement software-based security running on the SC000 core to ensure the strongest possible protection for users’ credentials. The contactless IC is the STS3922 RF booster, which uses active-load modulation (ALM) to maximize transaction range and omnidirectional radio performance in card-emulation mode. This enables wearable devices to be easy to use, with equal or better device-to-reader positioning tolerance than conventional contactless smartcards, even though a smaller antenna is used. Using ST53G contributes to final device cost optimization, as small antennas can be etched onto the PCB at almost zero additional cost. In some cases, a challenging metallic case can itself be used as part of the RF antenna. In addition, automatic power and gain control, configurable sensitivity, and configurable signal/reader-field phase difference ensure consistent communication over all ranges while enhancing interoperability with different types of readers and terminals including various types of transportation ticketing systems. The STS3922 has inherently low power consumption, and a dedicated secure-microcontroller wake-up output allows the ST53G System-in-Package to maximize battery life by powering down when not in use. The ST31G480 secure element is EMVCo and Common Criteria certified, and the STS3922 is ISO/IEC 14443 and EMVCo Level 1 compliant, ensuring full interoperability with existing payment and ticketing infrastructures. In addition to radio-tuning tools, ST also provides Software Development Kit (SDK) platforms for implementing card services on various wearable-device architectures, as well as reference design, expansion boards, and pre-certification services to help simplify development and accelerate time to market. This entry was posted on Thursday, October 19th, 2017 at 1:13 pm and is filed under Advertiser, News.